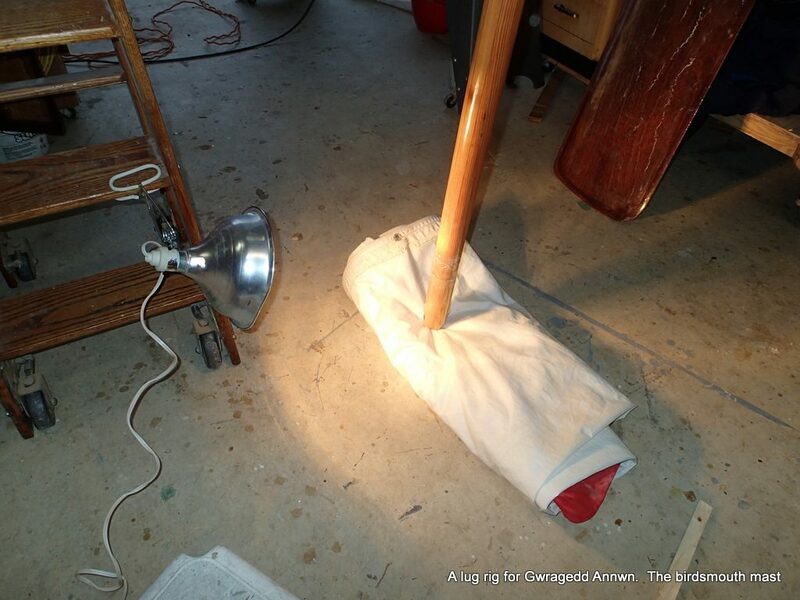 The epoxy has cured on the base of the mast reinforcing. I used 6oz. cloth, left over from Paul’s Canoe build. 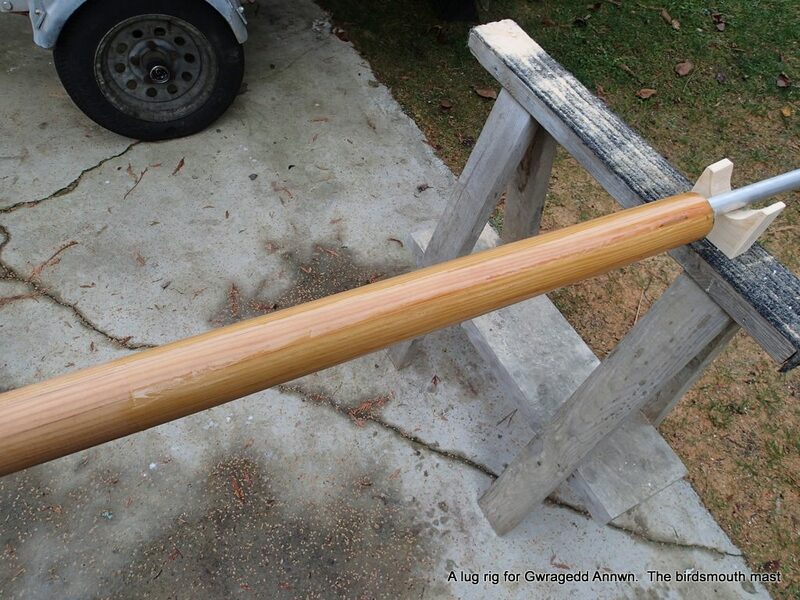 Mast outside ready for wet sanding…again, rain was predicted for today, but no rain. 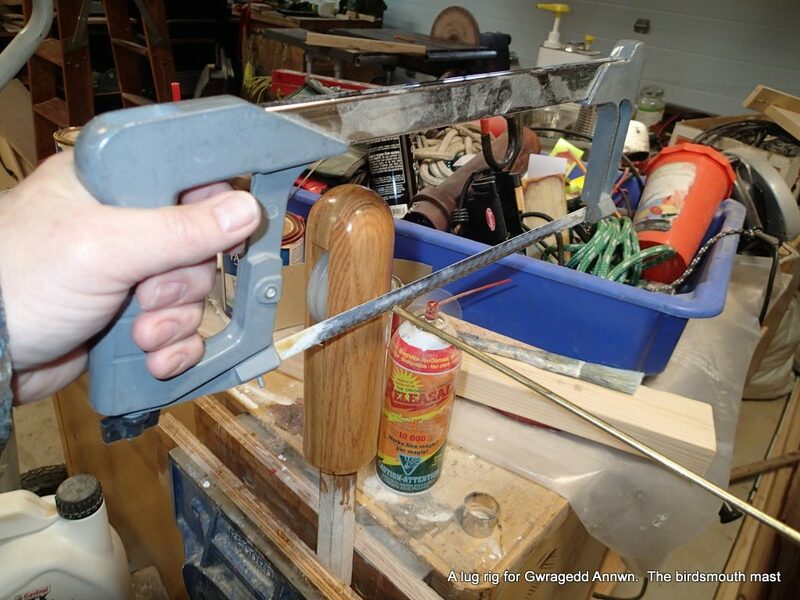 I get out the wet/dry 350 grit sandpaper & bucket of warm water with a little soap again. 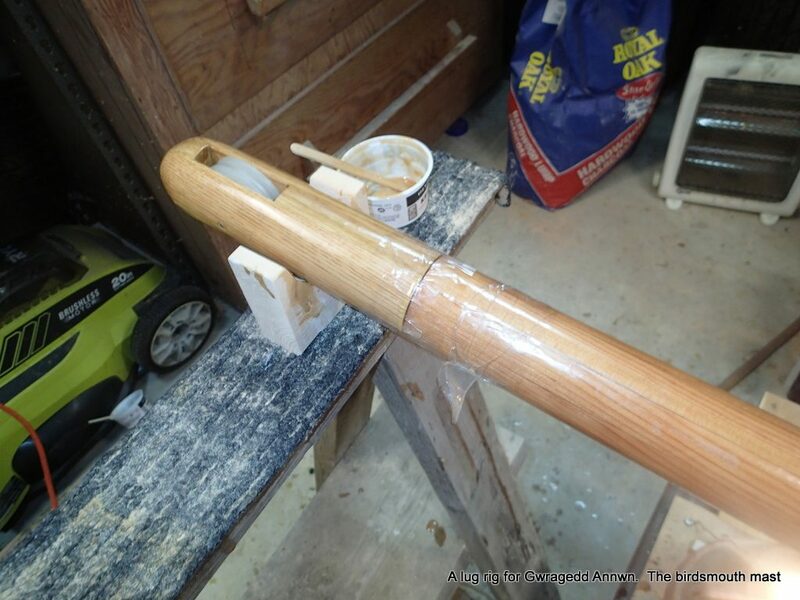 I sand smooth the joint where the cloth meets and where I did a little filling. Masthead Sheave plug assembly dry fit. I take the Masthead Sheave plug assembly into the house to fit the sheave, washers and pin. 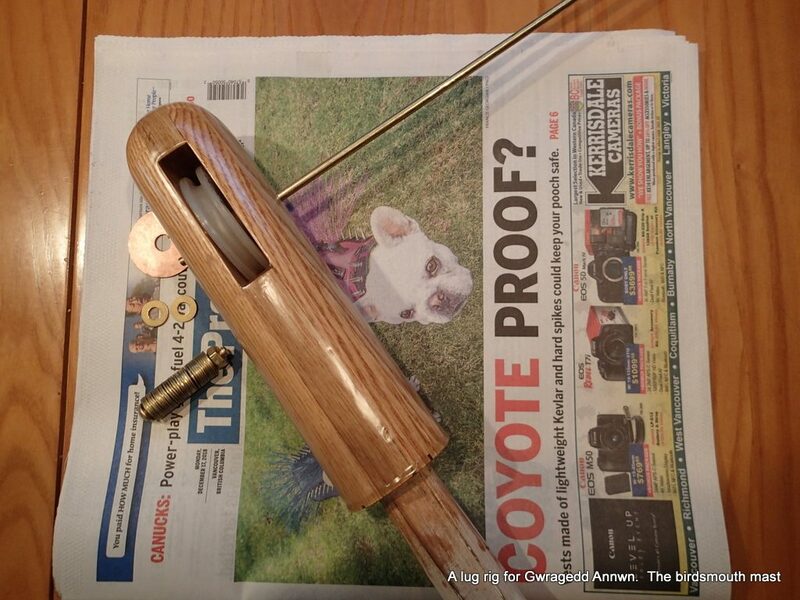 The pin is 3/16″ brass rod. I got the brass washers from Roy. I take the assembly into the garage to cut the brass pin. Nothing high-tech here. Mark the pin, push it out a little. Cut. After I cut the pin to size, I file the edges smooth. Ready to epoxy the plug into place. 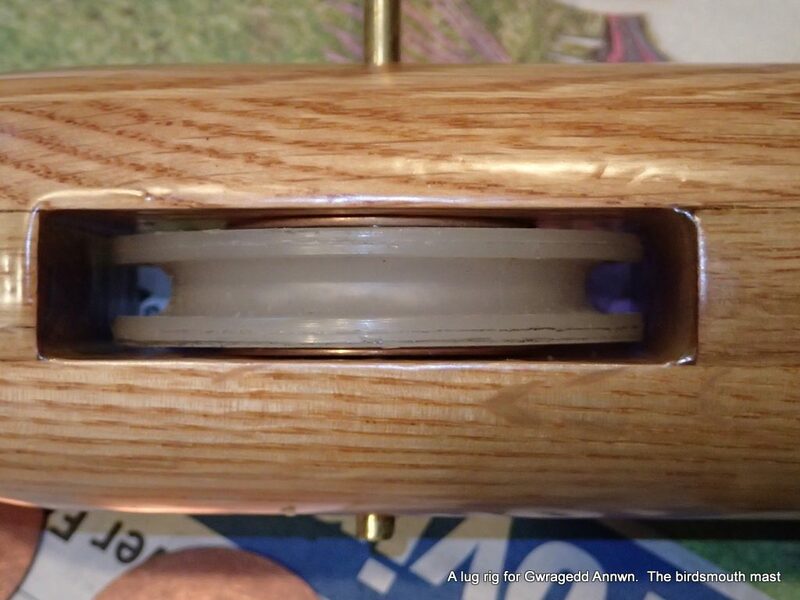 I sand off any varnish on the base of the plug, so, the epoxy will soak into the wood. Same with the mast head. 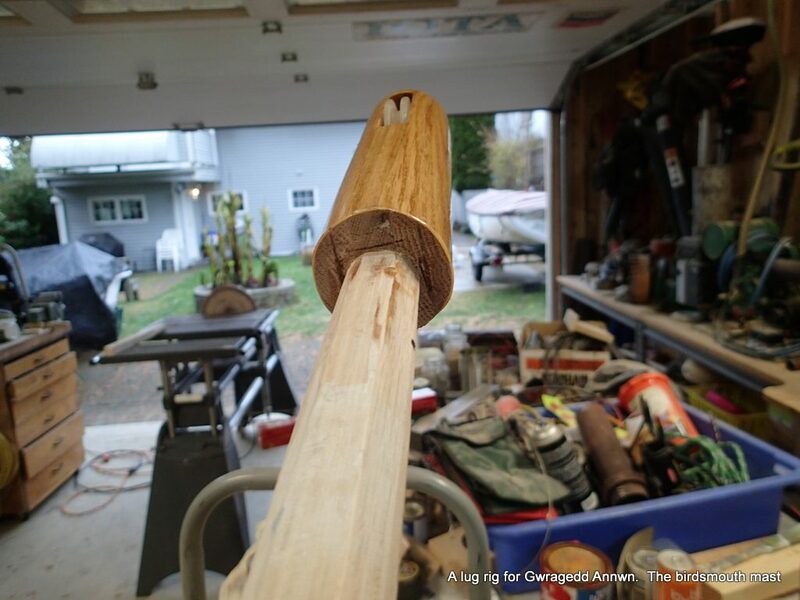 Both the plug and the masthead are sanded down to bare wood. 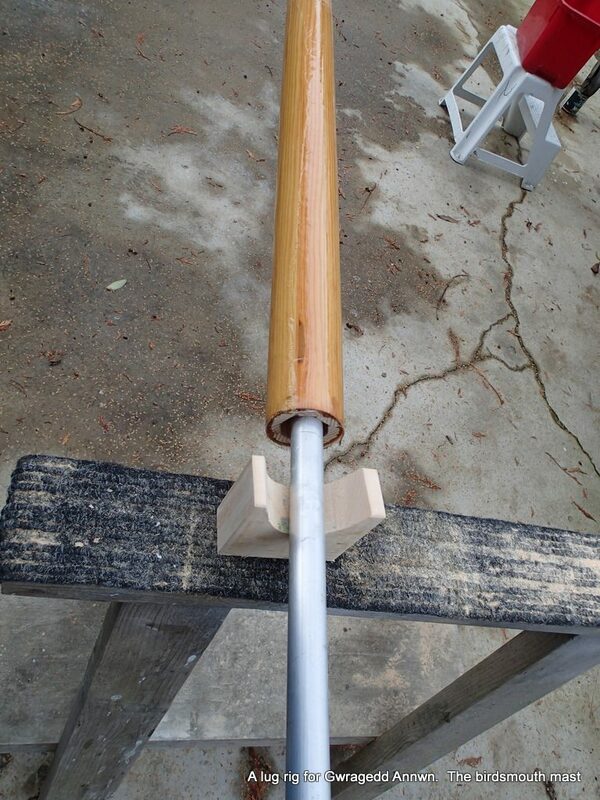 I set up the mast stand and then mix-up the epoxy. Two hundred stirs. Dry fitting the bamboo Masthead sheave plug pin. 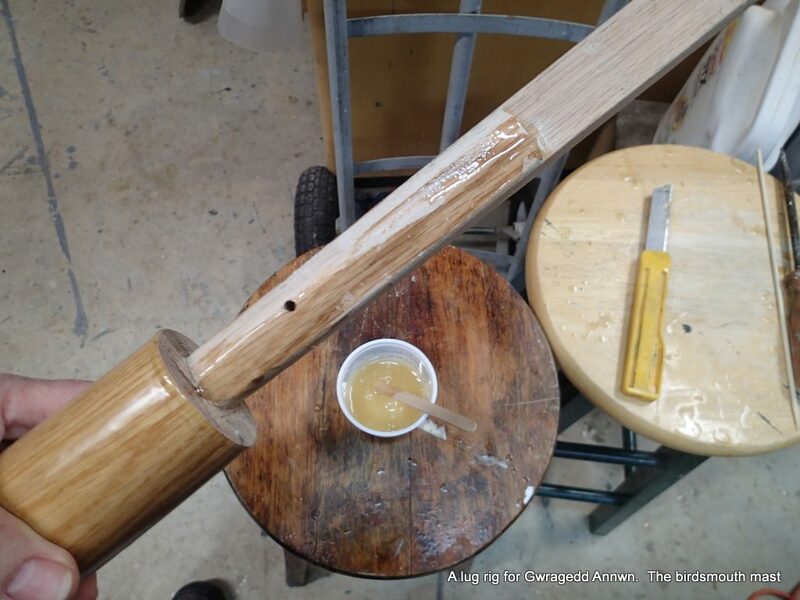 I coat the Masthead sheave plug shaft and the inside of the mast with the un-thickened epoxy. 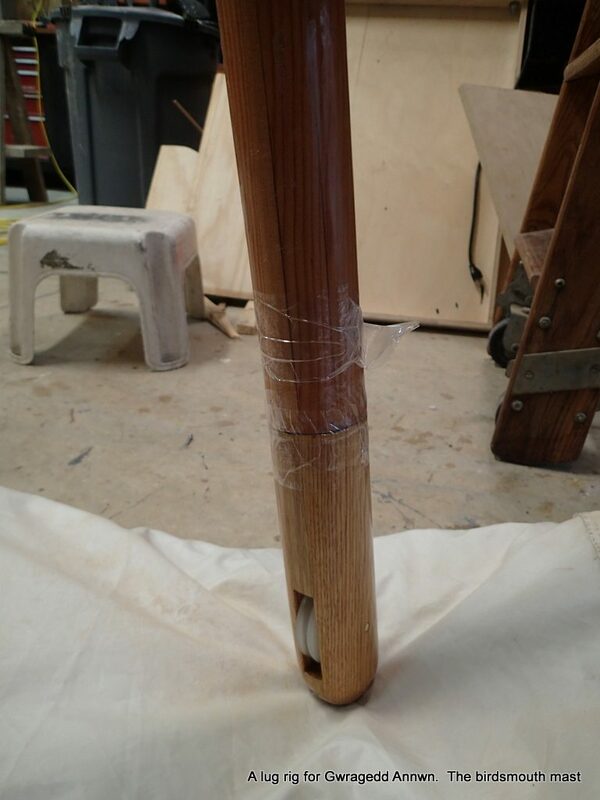 I make sure to epoxy the bamboo pin and its hole. After I have coated all the bare wood with the straight epoxy, I add wood dust to thicken the epoxy. 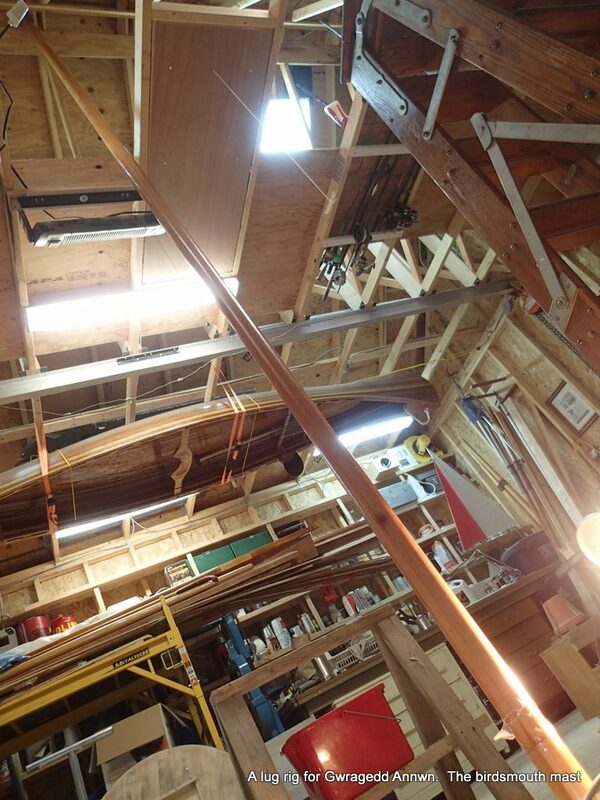 I put the base of the mast on the floor, angling the mast up towards the top so the epoxy will, if anything, run down into the mast. 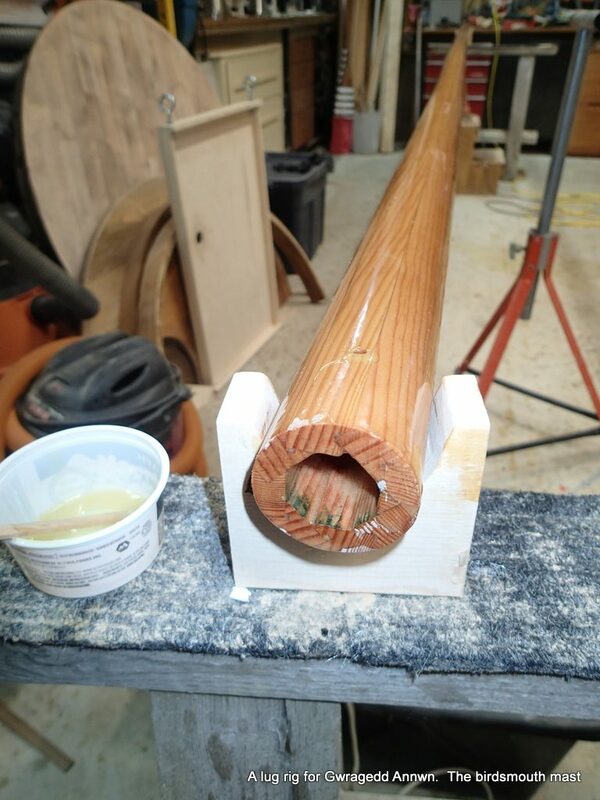 I fill the mast head with the thickened epoxy mixture. 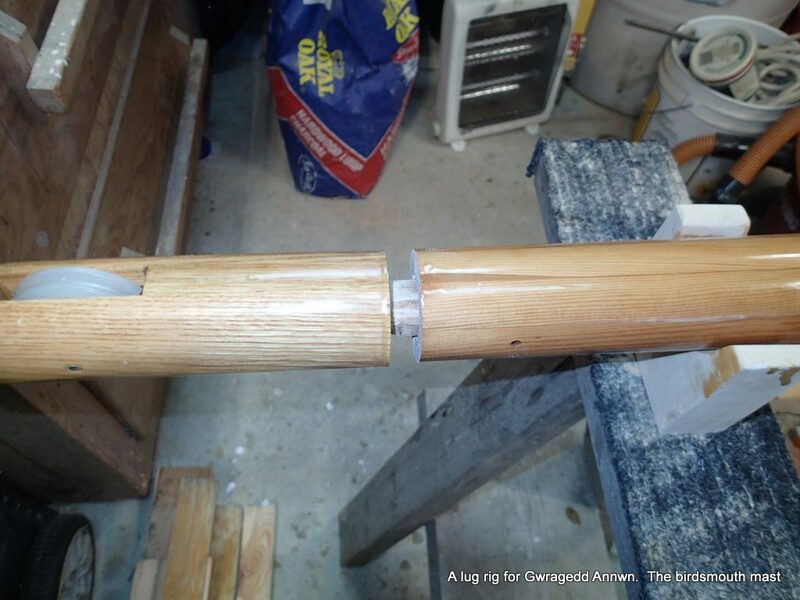 I insert the Masthead Sheave plug, the bamboo pin and then wrap the joint and pin ends with packing tape to prevent the epoxy from leaking out. It is hard to see from this angle, but the mast does angle down to the right. To have all of the epoxy settle around the Masthead Sheave plug, I place the mast upside down in the centre of my garage. Gravity will make the epoxy flow down and around the plug stem. Mast upside down, joints sealed with packing tape. Heat lamp is shining on the joint. 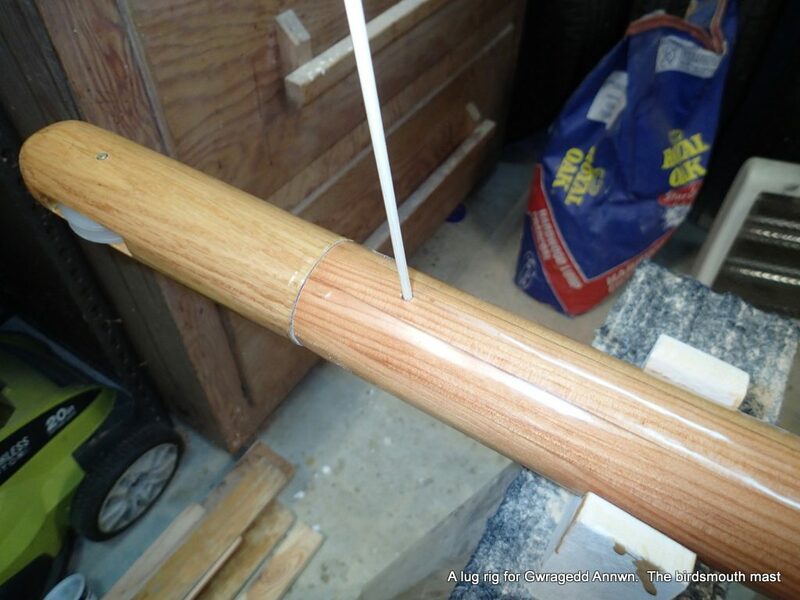 I rotate the mast every 30 minutes so the epoxy will settle evenly. The distance to the inside peak of my roof is just a little over 17″. The mast barely fits!!! Gwragedd Annwn’s mast reaches to the peak. 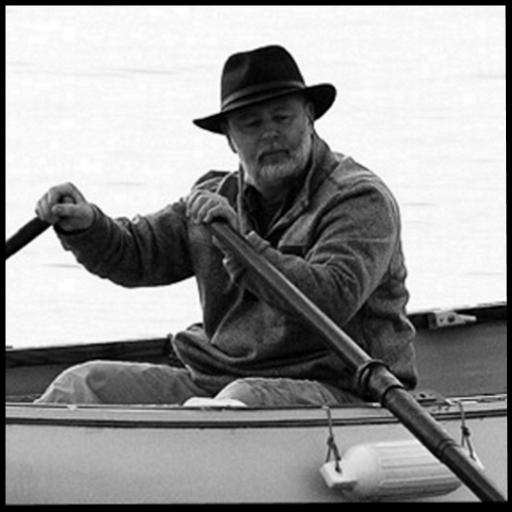 Paul’s Canoe in the background. 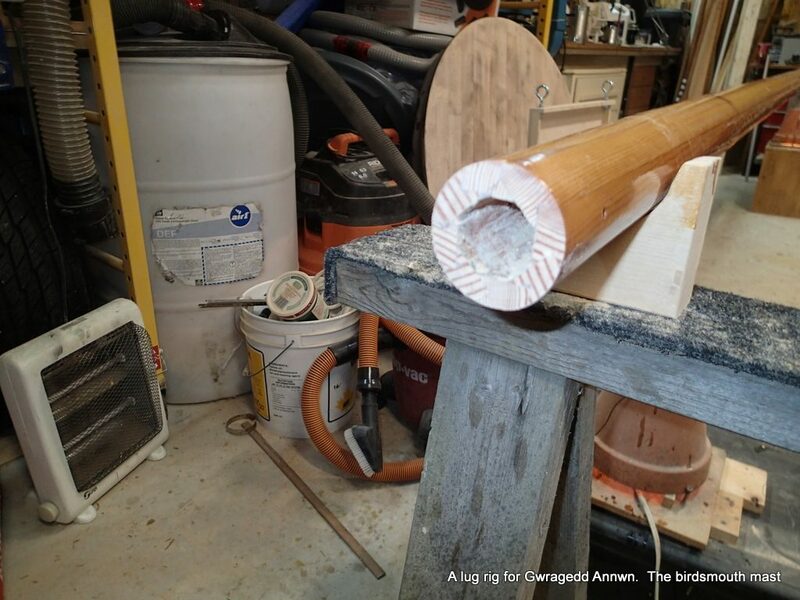 Next step is to make the mast base plug. I have a piece that I will fit into the base. 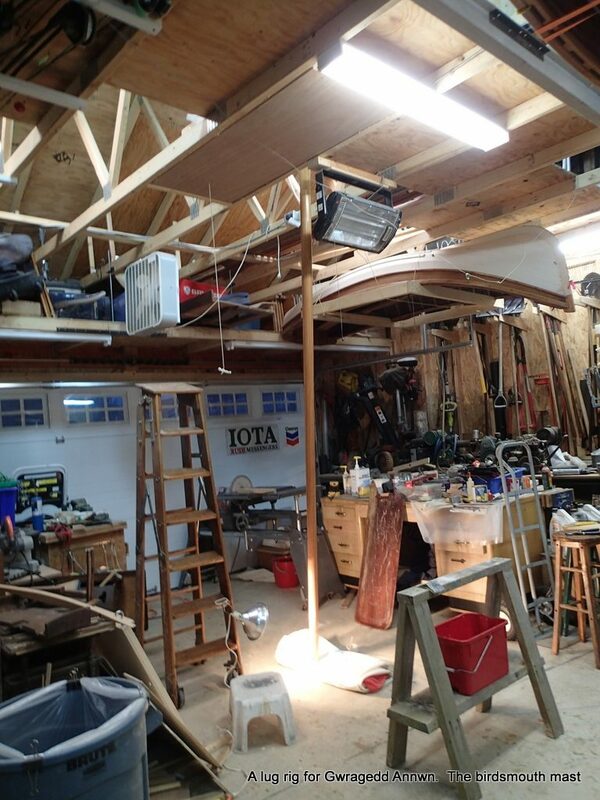 Tomorrow’s job….the mast is almost finished! Another view. That is the Vancouver Wooden Boat Society’s Douglas rowboat being stored. Small correction. The large washers are bronze.